1 The name of the praying mantis might make you think that this insect is gentle and kind. It has long front legs that are bent and held together that make the insect look like it's praying. But in this case, looks are deceiving. 2 The praying mantis is a carnivore. Carnivores are meat eaters. 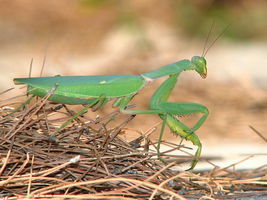 The praying mantis eats butterflies, crickets, grasshoppers, flies, and other insects. The praying mantis is usually green or brown and very difficult to see as it sits on a leaf or plant. It waits very quietly for its prey and doesn't move. When its victim gets close enough, the praying mantis jumps out and grabs its prey. The front legs of the praying mantis have little spikes that help to keep the prey from getting away.